Phil Snedecor's Low Etudes for Tuba has been a staple in my studio since it was first introduced over two decades ago. This book covers a wide range of styles and provides encouragement for the musician to think of low notes on the tuba as a melodic endeavor rather than simply producing low frequency tones. For tuba players it is often very easy to think of low register playing as an instrument-centric, physically focused, non-musical activity. But, as Arnold Jacobs would often say, “Take charge of your music. noti"? your instrument.” Because they are so stylistically suggestive, Low Etudes for Tuba inspire the performer to do just that. Bravo Phil! Most college tubists today face an interesting dilemma. While they faithfully practice their etudes week after week, they find that they are sometimes not prepared to create the broad sound and large volume in the extreme lower register demanded of them when they begin to play orchestral works of Prokofiev, Mahler, Wagner and others. The answer in the past has been to take common etudes such as Rochut or Concone down an octave or two in order to solidify one's lower register, or to go directly to the source and practice these orchestral parts in hopes that the sound will soon begin to resemble that of an orchestral tubist. 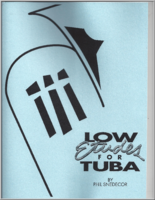 "Low Etudes for Tuba" were written to address this problem and perhaps avoid it completely. By introducing this type of playing to one's daily routine early in the High School or College years, the struggle for mobility and confidence in reading this register becomes greatly reduced or even eliminated. By addressing a variety of styles and keys within this register, it is hoped that these etudes will be musically fulfilling as well as educational. Thanks to john Cradler for his insight and inspiration for this book.